We saw some winners and losers, folks. First of all, we met with an apartment locator with a name that sounded like Huevo but wasn’t Huevo (which was learned once he spelled it for us and I realized I was way off and was glad I hadn’t informed him that his name meant egg in Spanish), plus two other men, one in slacks and one carrying a motorcycle helmet. The helmet guy’s job was to open the windows and doors for us. We never learned Slacks Man’s role. However, at one point he graciously asked if he could hold my water while I took notes. “Thank you,” I said, handing him my bottle. He took it and immediately shoved it to the guy holding the motorcycle helmet, so at least we can surmise his role is not holding my water. 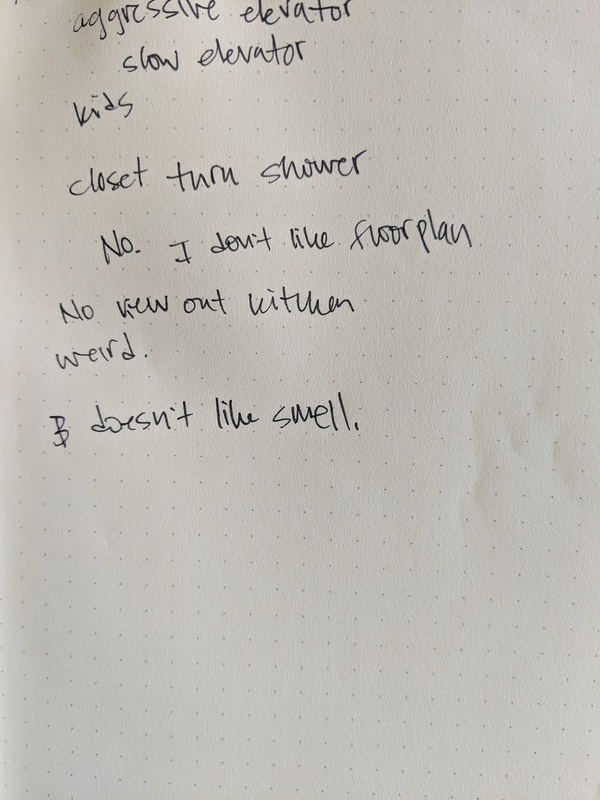 Here are my notes from one of said losing apartments. Translations below. Aggressive Elevator: The elevator door straight up CLOSED ON ME and I have a bruise on my wrist now. Slow Elevator: After the aggressive elevator incident, the staff decided that one wasn’t working and ushered us to another elevator. This one took about seven minutes to open. Kids: Three adorable chubby Asian toddlers and their non-chubby mother waited on Slow Elevator with us. One chunky boy hid behind Benson’s leg once we got on. Then he kept waving at us and saying, “Bye!” Living near them would be a perk, but unfortunately even a cute baby wouldn’t make up for what we saw next. Closet thru shower: A fourth man grandly gestured toward the bathroom shower: “Plenty storage!” he beamed. I entered the bathroom and saw a tiny shower stall. One wall of the stall had a small door on it. Through that was another small room with shelves on the wall. Just. . . no. No: I am displeased with this apartment. I don’t like floorplan: See “Closet thru shower.” Also, the dining room was raised, and the step up to it was coming loose. “Careful!” our apartment locator warned. Off the dining room was a room about the size of this room I remember seeing on a field trip in first grade to some place where servants had lived. On the field trip one of my classmates exclaimed, “That’s the size of my closet!” but it was actually a bedroom for a lady who had to milk cows and weave tapestries for this rich family. Anyway, the room in the apartment was supposed to be a bedroom, too. No view out kitchen: They’d blocked the widow with a washing machine. Bummer. Weird: See all of the above except for the kids. We’re headed out again in a few minutes with Not Huevo and who knows else to see some more.